It’s surprising I haven’t heard of Halima until recently, through Gigi Hadid’s Instagram story. The well known international model had posted the TeenVogue July cover featuring a hijabi model that I had only vaguely recognized and I just needed to tap on the account. Halima peaked my interest immediately. She’s an African-American hijabi model, of Somali origin, and a refugee who lived for 7 years in Kakuma camp in Kenya. Until a few years ago, the idea of featuring Muslim head-covered models on the front cover of a massive fashion magazine was unheard of. The standards have usually portrayed the image of another time: thin-waisted, blonde, skinny models with fair skin… i.e. white models. The fashion industry is undergoing a revolution by diversifying race and body image. It has led to the empowerment of women and men of the minority. This new found change is breaking down the walls that have always kept anyone who didn’t fit that standard out of runways and fashion campaigns. That is not to say that we don’t have a long way to go. But Halima is still breaking barriers. She set an example of tolerance in an industry where it has always defied the odds. Fashion really is a statement after all, and what better statement to make when you’re all that Trump’s organization strives against? Muslim bans, intolerance, racism, bigotry, misogyny and white supremacy. Halima defied them all by posing proudly in front of the masses of cameras, in her hijab. She is currently very sought-after by high fashion brands to model for, including Nike, Yeezy, and Max Mara. For the Nike collaboration, she has sported the breathable mesh hijab that launched in spring of this year and it has further boosted the image of the traditional Muslim headscarf on a global scale. It sold out in weeks. She has instantly become a major inspiration to any girl who looks like her and dreams big. 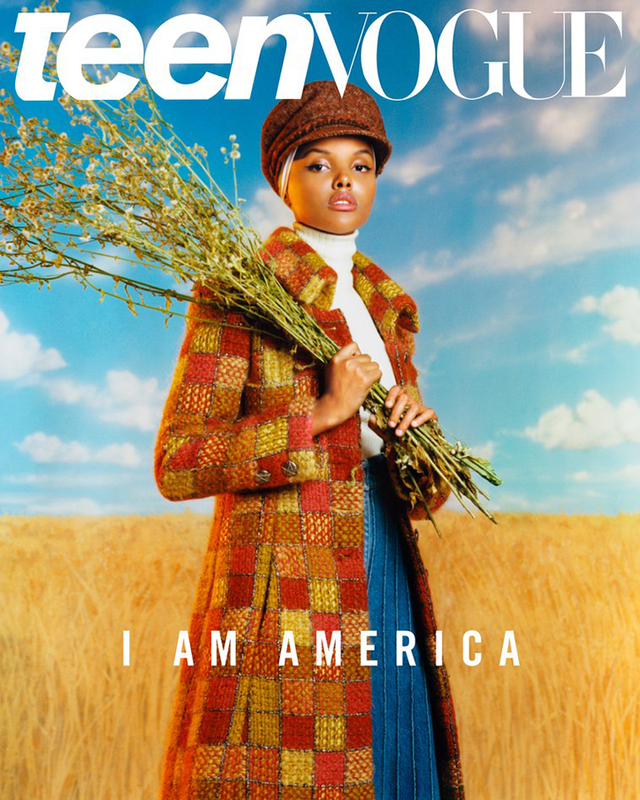 This July, however, she went on a special editorial story for TeenVogue. She went back to Kakuma, a refugee camp she was born in. Being a refugee herself, she decided to head home and gave a very powerful speech concerning the current refugee crisis. Halima is also an ambassador for UNHCR, standing up for migrant children and advocating for refugee rights. Part of the American identity is about overcoming obstacles. And as much pride as she has in her cultural background, she remains grateful for her chance to be raised in a country where freedom of thought is Queen. If she had remained in Kakuma, Halima wouldn’t have been able to head to the US today. Trump’s travel ban includes citizens of Somalia, as well as 7 other Muslim majority countries. Imagine for a second just how fundamentally wrong his decision has become. A beautiful, smart, kind and powerful woman so young like her who defied the odds would have never been known in Kenya or Somalia. The injustice in this world springs from the lack of awareness and education. Countries raged by wars are held by tyrants who feed on fear to keep them unaware of the “dangerous impact of freedom”. Trump, sadly, is doing the exact same thing. Freedom to him has a different significance. His own views relate to a controlled freedom, a variation that resulted in lobbying for gun rights, holding onto the Second Amendment and the expulsion of immigrants to grant the power to white supremacy. I have been to the States once, to New York City, and I saw just how much diversity exists there. Standing on the subway platform every third person looks different and speaks a different language, be it English, Spanish, Italian, French, Arabic or Portuguese… but regardless of language, they’re all American. Ever since the United States earned its Independence from the British colonies, on the 4th of July in 1776, it has become a country built by immigrants. Halima is part of that legacy. And I hope there are many more. This article was originally published on missmuslim nyc.